Travel back in time to the ancient civilisations of the Egyptians, Hittites, Assyrians, Babylonians, Israelites, Greeks and Romans to understand how these people lived. Discover the exhilarating work of archaeologists in the field both today and in the past. Learn of the thrill that comes with exciting discoveries of modern archaeology. Visit lost cities such as Petra and Pompeii, and walk in the footsteps of Jesus and the prophets in the Bible Lands. 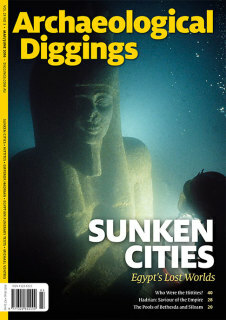 Following the unfortunate trend of the publishing industry, we have to suspend publication of "Archaeological Diggings” and this will be our last issue. However, we will continue to provide a monthly emailed Diggings Newsletter containing the latest news and finds from the world of archaeology. Subscribe to our newsletter to receive this. And if you wish to complete your collection and are missing a particular magazine, please contact us to arrange purchase and delivery. Beginning in July 2016, Archaeological Diggings begins a newsletter, informing you of discoveries and research sifted from the subterranean world of archaeology, as well as Diggings-related offers and events closer to home. Subscribe to receive our free monthly missive, delivered to your inbox. Aliens or Egyptians - Who Really Built the Pyramids?